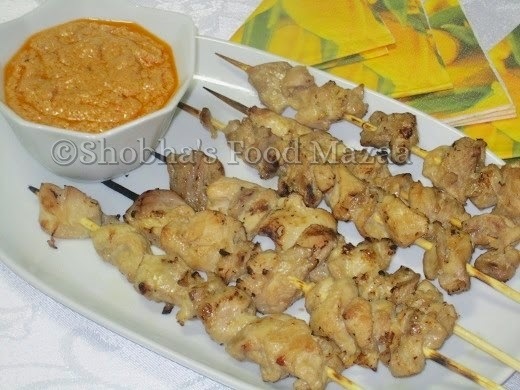 Chicken satay peanut sauce is a perfect party snack.. always a hit ! Salt ... a pinch or two, because soy sauce is already salty. PEANUT SAUCE - click HERE to see the recipe. 1. Clean the chicken and cut into small pieces. 4. Thread the chicken into the sticks.Cook them under a pre-heated grill for about 3-5 minutes on each side or until done. Serve immediately with hot peanut sauce. You can prepare the sauce a day before and refrigerate it. Reheat it before serving. delicious recipe.. never tried before.. Yummy!! So simple but seems very delicious!! Yes Divya.. I like it a lot too. Wow this looks so easy to cook. Yes Raksha.. easy and yummy snack. Yes Dear.. it is !